Innovation is an ancient art, may be as old as 500,000 years, but managing innovation is a relatively young management technique, only a few decades old, and has received much less attention than other aspects of innovation such as creativity, entrepreneurship or venturing. This book is not about providing a series of recipes on innovation management or a collection of case stories on how to do innovation or not. The few examples given are well known innovations from (Shell) history and all of them have been described before in the literature. However, this book does not focus on the brilliant result or failure of the innovations, but on the process of innovation in order to understand the features of a well-managed innovation effort. Understanding innovation as a business process and how it has developed through history. For a manager it is essential to appreciate the fundamental difference between inside- and outside-the-box innovation; each one needs its own specific management process. The main roles of the innovation manager are managing the innovation funnel, executing the innovation strategy and optimising the value of the innovation portfolio. Entrepreneurship is the key resource in innovation and the right conditions have to be created for it to flourish in large companies. The value of innovation can be assessed as an option value and in creating intellectual capital for the company. Integrating sustainable development in the innovation process requires changes in the management process, in the assessment and valuation of innovation, and in the interaction with the stakeholders. · Extremely practical book, based on hands-on experience and written to a high academic standard. · Provides unique and novel perspectives into the innovation process. 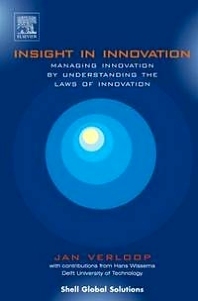 · One of only a few titles that discuss how to manage the innovation process. Academic libraries, industrial libraries and individuals in industry (management), professionals and consultants. 1.1 Lessons From The First 500,000 Years Of Innovation. 1.2 The Universal Stages Of The Innovation Process. The three stages. 1.3 The Process of Innovation. The bridge building innovation model. The innovation processes through history. The dynamics of innovation and transformation. 3.1 Innovation is a Business Process. 3.3 The roles of the Innovation Manager. 4.1 Implementing the innovation options. The fight back of the old technologies. 5.2 Assessing the Value of Innovation. The value of a portfolio of options. 5.3 Innovation creates Intellectual Capital. A segmentation model for Intellectual Capital. The value of Intellectual Capital. The value of Intellectual Property. The challenges for sustainable innovation. 6.2 Learning from the Future. Sustainable innovation creates Societal Capital. 7.2 The Laws of Innovation. Jan Verloop is consultant in innovation. Besides innovation he has extensive experience in process and product R&D. He advises both start-up and multinationals in Europe, Asia, and America and has built up first-hand experience with successful and failed innovation projects. He is a non-executive director of Oxford Catalysts, a very successful start-up company which started in the cellars of Oxford University and now has facilities in the UK and the USA. He has lectured and advised on innovation in developing countries at major international conferences and smaller think-tanking sessions with heads of state and leaders in government and business.